Now, butchers put small pieces into an aluminum loaf pan and cover it all at once. 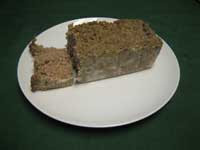 In the Frederick, MD and Lancaster, PA areas with a strong German heritage, scrapple and pudding is sold by butchers. While I have eaten scrapple all my life, I never tried pudding, or meat pan pudding. Although pudding looks like scrapple, it does not fry as a solid piece, but as small pieces of meat in melted fat. Pudding can be cooked in a steamer insert with the fat dripping into the water. Once cooked,the pudding is served over hominy, waffles, toast or fried potatoes. It can be topped with King Syrup or syrup. Pie filling can also be made from it... a Pudding Pie. pudding and hominy is traditionally eaten in Frederick Maryland and points South. The pudding is cooked first and then Manning's Hominy from Virginia( originally from Baltimore) is stirred in. It is served with white toast and butter.My father Frank and Uncle Herman's favorite! Steam the hominy with the pudin add onion pure deliciousness ! Stoney Point Farm Market In Littlestown PA just across the MD line makes it .